Sam Sheedy says he hopes the man who took away his Commonwealth title goes on to bigger things. There is not a trace of bitterness in Sheedy, who retired days after being stopped by fellow Sheffield middleweight Liam Cameron. He is now pursuing a training career, but will keep a friendly eye on the one-time rival. “I hope he goes on to do great things” said Pitsmoor-based Sheedy. “I could see in his eyes before the fight how much he wanted it. Cameron decked Sheedy several times before the referee stepped in. 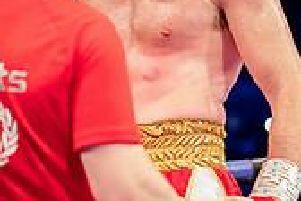 “The body shot, cramped up every time he hit me there” said the Sheffield Boxing Centre veteran. Sheedy had previously labelled Cameron as lazy and indisciplined. But that was just part of the build-up, he said. Asked if Cameron could go towards the Elite level, Sheedy replied: “If he can stay as switched on as he is now, why not?